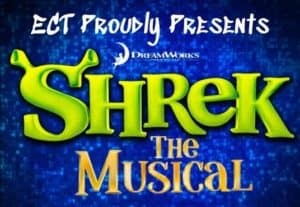 The Elmhurst Children’s Theatre presents Dreamworks’ Shrek the Musical on Friday, Saturday and Sunday, January 25 through 27, 2019 at Timothy Christian School in Elmhurst. Both evening and matinee performances are available (see schedule below). This family-friendly production features talented Elmhurst kids singing, dancing and acting up a storm as the green ogre Shrek, his sidekick Donkey, the beautiful Princess Fiona, and other familiar characters. At Elmhurst Toyota, we appreciate having a children’s theatre group right here in town. We think you’ll enjoy Shrek the Musical and encourage you to attend one of the performances. Your children may see their friends and classmates performing in Shrek the Musical. If they’re interested in getting into community theater themselves and are in grades one through eight, check out the Elmhurst Children’s Theatre year-round schedule of classes at www.elmhurstchildrenstheatre.com. These musical theater and sketch comedy classes are fun for kids, build their self-confidence and may help them make new friends. Children in fifth through eighth grades who are Elmhurst residents or attend any Elmhurst Community Unit District 205 schools are eligible to audition for Elmhurst Children’s Theatre productions. Helen Knudsen directs Shrek the Musical, Nina Burns is the choreographer and the music director is Melanie Hughes. Much of the behind-the-scenes work of managing rehearsals, creating costumes and building theater sets is handled by a dedicated group of parent volunteers. Shrek the Musical is brought to you by special arrangement with Music Theatre International. These performances are dedicated to the memory of David Rice, a six-time director of Elmhurst Children’s Theatre productions. The Elmhurst Children’s Theatre has been part of the community since 1948. It exists to provide children with a unique live theatre experience in a positive and supportive learning environment. Please support the good work of this non-profit organization and attend Shrek the Musical. We hope to see you there! Friday, January 25: 7 p.m.
Saturday, January 26: 2 p.m. and 7 p.m.
Sunday, January 27: 3 p.m.
For group reservations, please contact Mary Eileen Kungl at mekungl@elmhurstchildrenstheatre.com.